As you can see in the above video, U2 look to be in good spirits now that Bono is on the mend from his recent back surgery. Not only that, but the band has rescheduled the 16 US tour dates that they had to cancel following their frontman's injury. The rescheduled tour dates, which have sold more than a million tickets already, include a 21 May 2011kick-off in Denver, Colorado, and a final performance on 23 July 23 2011 in Minneapolis, Minnesota. Prior to that, U2 will begin the planned European leg of their U2 360° Tour dates in Europe, beginning in Turin, Italy, on 6 August. 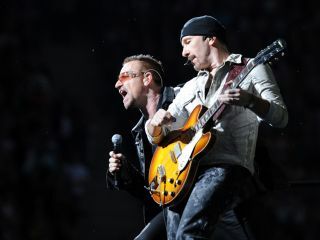 In the video, guitarist The Edge jokes about his extra-curricular activities during the past couple of months. "You don't want to sit idly by," he says. "So I got out there to see what the talent was like, the singing talent. There's some great singers out there. I got to play with Muse, which was amazing. But the funny thing is, it just wasn't the same. If I needed any confirmation, that was it: I want to be in this band. We've got the best singer."